The Blackbelly Barbados Sheep Association International was was founded in January, 1996 by Charles Beam of Newalla, OK, and and Rudy Crawford of Lexington, OK. and incorporated as a not for profit corporation in the State of Oklahoma on April 29, 1998. A book of registry was begun in April 1997 and demand for the sheep increased dramatically. Carol Elkins joined the association in 1998 and immediately took on responsibilities for Web master and for designing the association’s brochure. This brought awareness of the association’s existence and attention to its sheep to a much broader population, and membership has increased steadily since then. When attempting to correct the association’s name in 2004, the BBSAI learned that the Oklahoma Secretary of State required the association’s registered agent to be a resident of Oklahoma. Inasmuch as the association had no board members living in Oklahoma at the time, we reincorporated as a 505(c)3 nonprofit corporation in the State of Missouri on May 23, 2005. 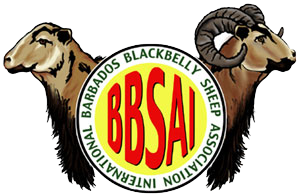 The association’s name was correctly filed as the Barbados Blackbelly Sheep Association International. The association also uses an acronym of its registered name, BBSAI. Raise, preserve, improve, promote and publish facts pertaining to American Blackbelly (horned) and Barbados Blackbelly (polled) sheep. Register and keep on file all records of registrations and transfers of American Blackbelly and Barbados Blackbelly sheep in the United States. Support and promote the interests of American Blackbelly and Barbados Blackbelly sheep breeders. Work together and exchange information and ideas that will be helpful in raising and preserving American Blackbelly and Barbados Blackbelly sheep. Improve the genetics of each generation of sheep, including artificially inseminated sheep. Sponsor shows and sales and to involve our youth in every part of sheep production. The BBSAI closed its registry for Barbados Blackbelly sheep in 2004 when an updated American Livestock Breeds Conservancy (ALBC) census of rare and endangered breeds revealed that there were fewer than 110 registered polled Barbados Blackbelly sheep in the United States. The actual number of living mature polled registered rams was calculated to be fewer than 12. The BBSAI wanted to ensure that no cross-bred sheep would be allowed into the registry, so closing the registry ensured that only sheep with registered parents could be registered themselves. The small genetic pool was significantly enlarged by the addition of sheep from the Virginia State University research flock starting in 2004. In addition, several “found flocks” have been registered, representing heretofore undocumented genetic bloodlines. The overall genetic diversity of Barbados Blackbelly sheep in the U.S. is still alarmingly small, but a private group of breeders formed a consortium in 2004 to help conserve the breed’s genetics and build strong new bloodlines. The BBSAI closed its registry for American Blackbelly sheep in 2013, acknowledging that there was sufficient genetic diversity in the American Blackbelly breed to ensure that it would remain a viable breed. A closed registry prevents sheep from being registered unless their parents are also registered. As a result, breeders are able to acquire American Blackbelly sheep that breed true to standard and do not exhibit any signs of crossbreeding, such as excessive, unshedding wooliness; white markings; and anything other than a dark black belly.